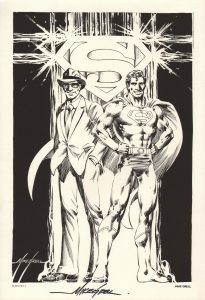 Released in 1984 as part of a collection of prints honoring the 400th issue (and 45th year of continuous publication) of the Superman Comic Book series launched in 1939, this print measures 10 by 14 ½ inches, is in nm/mint condition and will be shipped with the utmost care. Best of all, it is actually signed by hand by the artist – Mike Grell. Please note- the signature is real. It is the actual, hand-signed signature of Grell. It is not a pre-printed image or facsimile signature.